Welcome to Durango Volleyball Club. We are excited to share our love and passion for the game of volleyball. Our mission is to offer Durango, and surrounding communities, a quality volleyball program that everyone can benefit from. We have programs to meet every players needs, from beginner to advanced. Come check us out, and see what all the funs about! DVA is an introduction to volleyball for younger players ages 6 and up. The balls are lighter, and the net is lowered to make younger players successful. Players are taught the basic skills of volleyball, along with volleyball terms. The Redshirt Program is for athletes wanting the club volleyball experience, without the bigger committment of the club clost or the rigorous tournament schedule. Each Redshirt will practice with the club team. Camps, Clinics and private lessons. Coming Soon! Club Volleyball is a nationally organized youth volleyball network that allows players ages 10 (and even younger) to 18 to recieve advanced training and competition on local, regional and national stages. Why Choose Durango Volleyball Club? Durango Volleyball Club has been established for all players, from all schools, for one purpose. Our agenda is to provide great volleyball training to everyone. We Are Competitive - We will challenge our athletes to give 100% in practice and on the court. Our aim is to always get them to the next level. We will choose tournaments that will challenge the team as a whole. We want to bring the players to a place where recruiters can see their hard work pay off, and possibly go on to play volleyball in college. We want this for all our players! We Are Passionate - Durango Volleyball Club was formed by committed coaches who see volleyball as a stepping stone to greater things. We love the sport and are passionate about sharing our knowlege with others. We Want To Make Our Community Better - We want to provide a safe place for kids to grow and learn, and a sport they can play for years to come. Futhermore, we will be providing jobs opportunities to local residents, as well as helping our players get potential college scholarships. DO YOU HAVE MORE QUESTIONS? PLEASE FEEL FREE TO CONTACT US AT ANYTIME. We offer many options to fit everyones budget. Club Costs will include practice facility fees, all tournaments, uniform packages, equipment usage, experienced coaching, and administrative costs. $1250 for payment in full, and $1375 for payment plan. 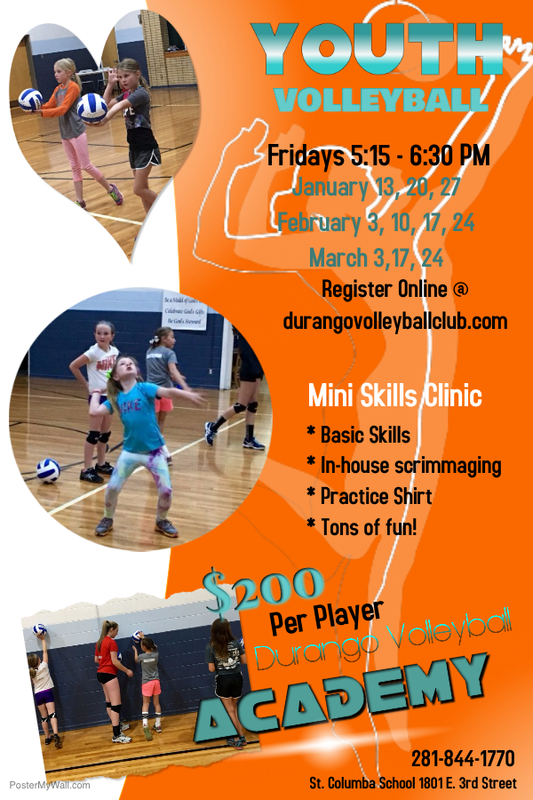 Durango Volleyball Academy caters to the beginning volleyball player. It's a 10 session course which covers basic volleyball skills, terms, offense and defense. We will have in-house scrimmaging to put it all together. Payment can be made at: Paypal.me/DVC2017 or Cash or Check at first session. The Redshirt Program is geared toward the player that wants to club volleyball experience without the big commitment. Each Redshirt will practice 2 times a week with club players. Costs include practice uniform package, equipment usage, gym rental and coaches fee. Camp schedules TBD. Camps will include tryout prep camps, specific skills camps, whole skills camps and more. Keep checking back for future postings. Private lessons will be available soon. There will be several levels to choose from. Please check back soon for additional information.